Messy, cluttered garages can happen to the best of us. When a garage has no clear rhyme reason, it is bound to become disorganized. 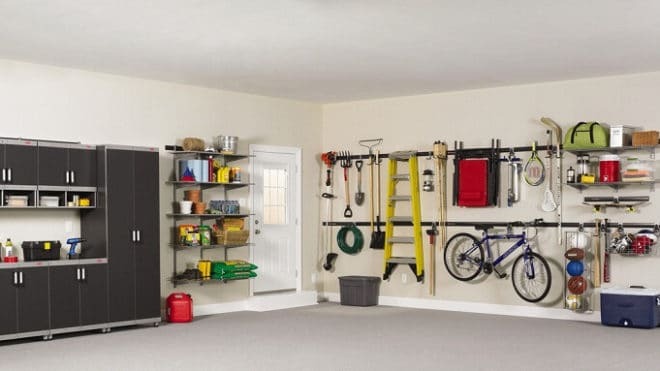 Luckily, there are steps you can take to better organize your garage. At Above The Rest Garage Door Repair, we look to find garage solutions. In this article, we will share five easy ways to organize your garage. A classic slatwall is perhaps one of the best ways to keep your tools organized. Slatwalls are made with a variety of horizontal grooves that are designed to fit a large variety of items. Install a slatwall if your garage doubles as your workshop. Keep all of your tools organized, visible, and within reach. A slatwall will function and look great in your garage. Bikes can take up a considerable amount of space. Luckily you can save space by storing your bike in several unique ways. If you use your bike on a regular basis consider a classic bike rack. Bike racks will allow you easy access while conserving space. For even more space, store your bike on your garage ceiling or vertically. Shoes can quickly grow into an overwhelming amount of clutter. If your garage doubles as a mudroom, designate a shoe rack. Shoe racks eliminate the stress of missing, disorganized shoes. This is a fantastic organizational hack for families or anyone who lives with multiple people. Kids toys can quickly dominate your garage, especially scooters, bikes, and wagons. If your kids have more room for their “vehicles” than you do it’s time to designate a parking space. With blue painter’s tape or duct tape outline an area in your garage specifically for your child’s vehicle. This organizational hack will eliminate fights, smashed bikes, and save space. Tubs are a great way to organize your things that don’t have a clear space, but are taking up too much room. Consider using tubs to organize bicycle equipment, holiday decorations, and emergency kits. If you can’t find space for something, put it in a tub. Remember to clearly label all of your tubs and store them in a convenient place, mounted shelving works especially well. At Above The Rest Garage Door Repair, we understand you want an organized garage with ample space. Our blog is dedicated to finding garage solutions. For the last fifteen years, Above The Rest Garage Door Repair has been working with property owners in the greater Denver, Colorado area. We offer proven results and will do everything we can to find cost effective solutions. If you have any questions, give us a call: 719-499-0491. Our customer service team will be happy to answer any question you may have. We look forward to hearing from you. How do you organize your garage? What organizational tips do you use? Let us know in the comments below!